Kathy, I got your book yesterday, and I couldn’t put it down. It’s so comprehensive yet simple enough for the Brain Gym beginner to understand. BRAVO! I’m having a meeting with my daughter’s principal next week about Brain Gym and I am going to suggest to the PTA that they buy your book along with the in-service I am going to do for the teachers. Seriously Kathy… you nailed this! Congratulations, Kathy! I just received my shipment of your book. Just browsing through it I can tell that many people will gain a better understanding of what Brain Gym can do for them. Thank you for sharing your knowledge, experience, and especially your love and concern for us all. • I gained insight into the practical implications for using PACE and other Brain Gym techniques. • I can see how using Brain Gym for just 3-5 minutes per day can support all learners, from those with special needs to high achievers. I love the way you really speak to the reader, it was as if you were sitting quietly beside me and explaining every so patiently all about Brain Gym. You include personal experiences that sometimes really took my breath away. Especially the one about 10-year-old Angela and Brandon… You intermingle studies and scientific facts, yet keep it at a fun and accessible level. The material is perfectly organized and flows really well. I thoroughly enjoyed reading it and can’t wait to recommend it to my students during my Brain Gym 101 course next weekend. Congratulations once again, on a superb job. Kathy, this is the most definitive, comprehensive, all-encompassing, beautifully written and presented book on Brain Gym that I have ever got my hands on! This will promote and clarify Brain Gym for many, many people. I for one will be recommending it to all students, parents, and teachers, and other professionals. It is excellent. Well done! Educate Your Brain is a wonderful contribution to a deeper understanding of how Brain Gym enhances the learning process. This very well written, practical guide fills in the missing gaps of learning with ease, through movement, as we achieve our best. Kathy Brown clearly guides the reader through “a how to use Brain Gym path” with the destinations being learning with ease, living with joy, increased coordination, and so much more. Hi Kathy ~ I love Educate Your Brain, and recommend it highly to anyone I speak to about Brain Gym. Your book makes the Brain Gym program easily understandable and accessible. I love the anecdotes; they are so inspiring! We found a large box in our vestibule this morning; and, lo and behold, it was from you — and what a joy to find inside our autographed copies of your excellent book, Educate Your Brain. Congratulations on a job well-done! We are loving every page. Thank you, thank you, thank you for sticking with a most challenging project and for creating an absolute, first-rate, professional book. Educate Your Brain will inspire thousands around the world to discover the whole brain-body connection that will help them to truly enjoy learning and to live more gracefully in these challenging times. Happy days and many sales! 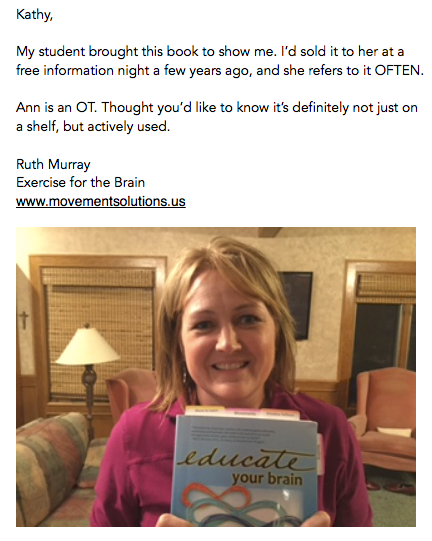 Educate Your Brain by Kathy Brown is one of my favorite books about the Edu-K/Brain Gym® program. Kathy embodies the principles of the Edu-K work in her writing by creating a user-friendly layout that is easy on the eyes, using whole brain language for easy understanding, providing background information for context, and practical application tips so the reader can do something immediately. Dive in! It’s at the top of my list of recommendations for those wanting to find out more about our program. * * * * * A must-read for anyone with problems or stress — isn’t that all of us? First off, I loved this book’s straightforward explanation of how to do many of the Brain Gym movements. Ms Brown peppers her narrative with directions on how to help people with many of the all-too-common problems we’re seeing in children and ourselves, along with heart-warming stories of how similar people have found help. It’s well-written and well-organized; shows how everybody, from toddlers to seniors, can benefit from little or big things that hold us back in living our lives. Brain Gym’s such a paradigm-shift in thinking that this wide-ranging look at the theory behind movement’s effects on our function is extremely welcome. * * * * * awesome!! I am an OT working in the schools. I read this entire book, could not put it down! Kathy Brown wrote it so well; she was able to target many audiences. She was thorough and I would love to go to her Brain Gym class! If you are a teacher or therapist or parents, this is a must! This book has provided excellent information about using various brain gym exercises to help the brain left and right hemispheres communicate better. It has helped bring clarity of thought. I have shared it with others who have been impressed and plan to get a copy for themselves. I highly recommend this book for anyone hoping to improve in school, sports,or organizational skills by better understanding of Brain Gym. “Educate Your Brain” contains valuable information for any teacher, parent, learning center, or individual. It includes a wealth of information! As a Special Education teacher in High School learning centers, I have used Brain Gym with significant results in reading, writing, and math skills. This book is excellent for anyone interested in learning about Brain Gym and the possible performance benefits. The book is comprehensive yet easy enough for people new to Brain Gym to understand. I shared this book with our school principal and she bought it on the spot. She said she wanted to use Brain Gym with the students who come visit her office. I also like that the author, Kathy Brown, uses real life experiences to explain how Brain Gym works-real people getting real results. ALL can benefit from this book. Not just for educators, therapists and the like. You can use it as a DIY learning program or as a just in time problem solution fix. Also the author does a very nice job of explaining the use for each exercise with why you should do it and some science but not too much. In Dr Carla Hannaford’s Smart Moves: Why Learning Isn’t All In Your Head, she goes over the science of why this stuff works in a VERY detailed way. So if you need that then that I recommend that book. Years ago I previously I purchased Making the Brain/Body Connection by Sharon Promislow for a kinesiology class which is a very informative book that I also recommend but I liked the graphics in Kathy Brown’s Educate Your Brain much more. I can’t pick one over the other as they both have really good points. I think Sharon Promislow’s book is a great intro to the topic of kinesiology and if you need a more educational slant I would go to Kathy Brown’s book. I liked that there were lots of pictures along with the explanations. It made it easy to understand. Thank you! Love it! Use lots of these ideas and exercises during my educational therapy sessions with students!